Here’s our fantasy premier league team tips GW14 article where the 2nd group of the FFGeek contributors show their teams for GW14. There’s Alex Ball, Mikael Danielsen, Prakhar, Costas Chari, Robert Cosgrove and Mikael Hietala. You can see the link to the part 1 contributors article here. Well another red arrow was expected………..and happened. Becoming very frustrating. 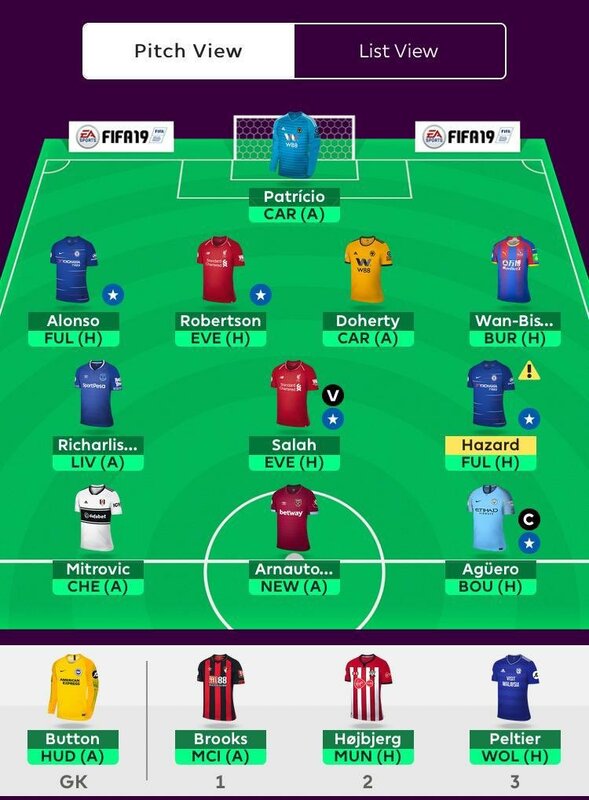 Another red arrow that could have been so much worse as I nearly sold Mitro (13 points) and benched Brooks (5points) in order to get Martial (3points) and Jiminez (2points) for a -12! This would have been a 25 point swing and I may have quit FPL! Despite the red arrow I actually like the structure of my team. 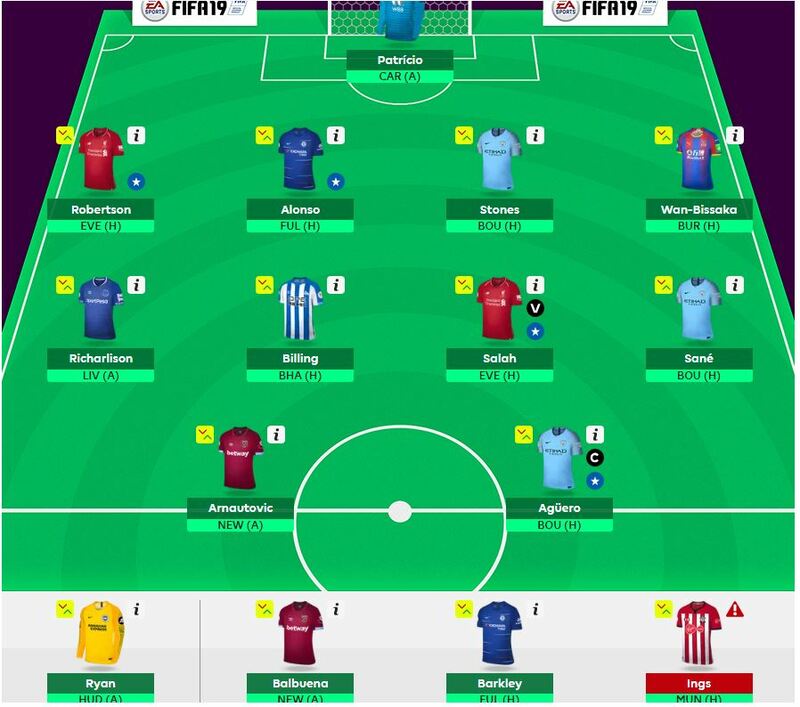 the outlying players (Mitro, Brooks, Wan-B etc) are great to have in place so now its a case of deciding the best City mids and if I want Kane in! On paper last weeks transfer of Peltier and Richarlison in for Mendy and Billing may seem odd but are with an eye to the future. I now have 2.5mil in the bank which will allow for some big changes next week. Capo of Kun with VC of Alonso or Salah. Good luck all and sorry its short! Another poor gameweek especially because Richarlison did nothing after me taking a hit to get him in! I am also losing patience in Aguero now as the Man City midfield are performing better than him. I want Murphy out my team but just don’t see a replacement option at the minute. 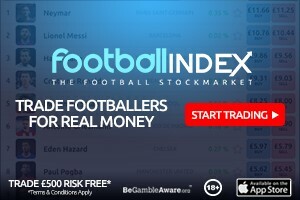 This week I have players in fixtures against each other Robertson VS Richarlison, Doherty VS Murphy and Wilson VS Ederson! Not the best scenario! Also Hazard is a doubt but Sarri says he should be fit so as it stands I am making no transfer this week, and I can’t really do much about the players playing against each other. 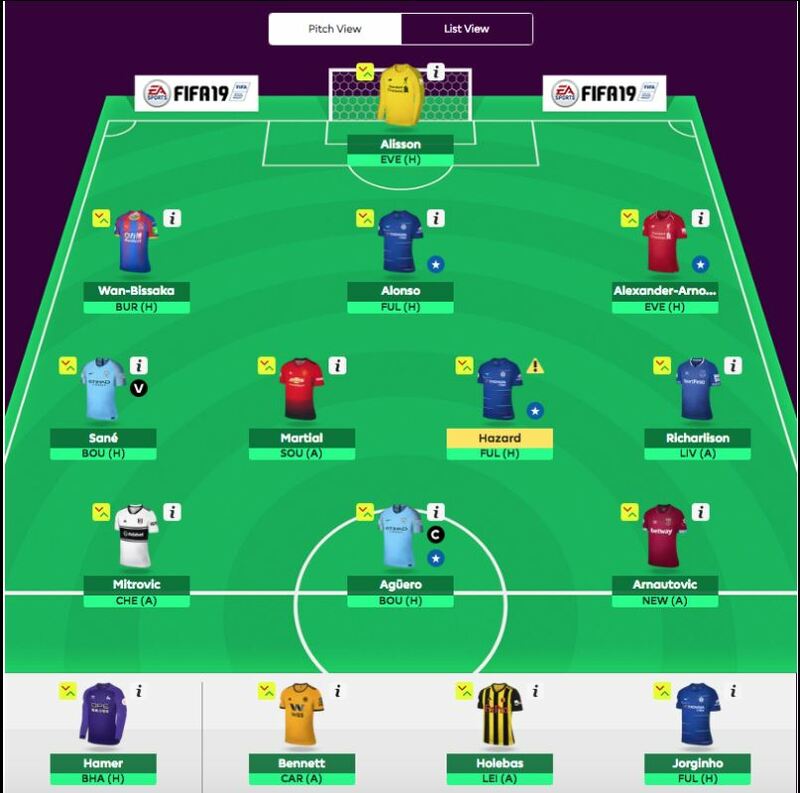 So after a horrible game week, we move on to the next one hoping for better things to happen.I am currently looking to bank a transfer to have 2FT in GW15. 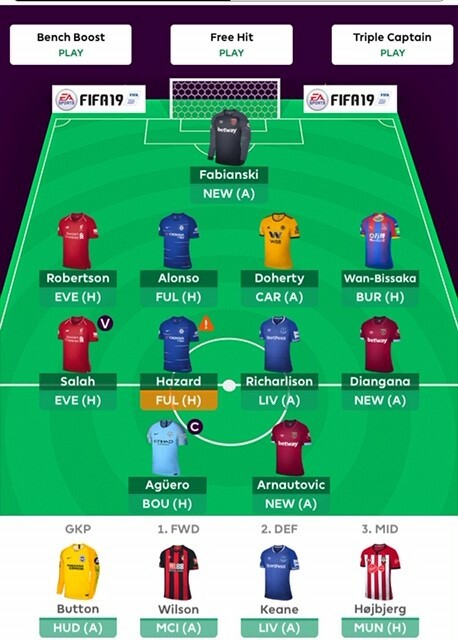 Captaincy is on Aguero due to the home fixture and the only decision pending is who to play from Diangana and Wilson.I’ll update the final team on Twitter. Good luck everyone and may your arrows be green!! Pretty straight forward lineup this week according to my players fixtures. I did not want to make any changes and bank my transfer but the long term injury of Lindelof is forcing me to act. Schindler takes his place due to good form and fixtures. This also allows me to save £0.5m. Along with the £0.8m I already had in the bank I now have the funds to make the switch from Aguero to Kane next week. 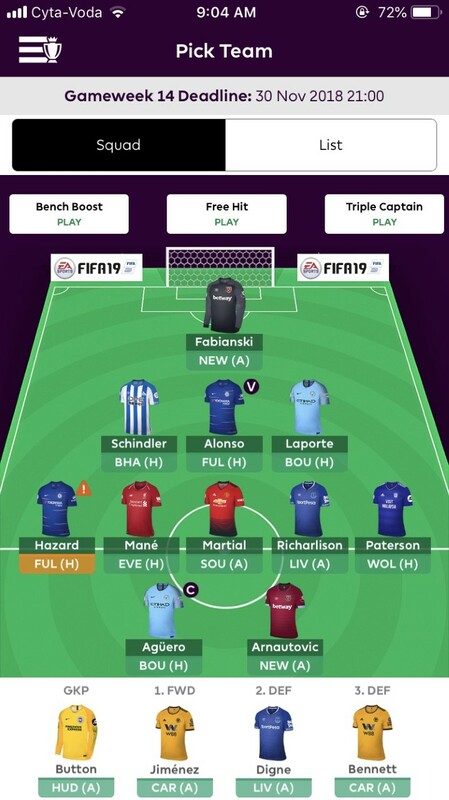 Captain I am currently on Aguero even though I fear rotation. Vice captain will be Alonso as if Aguero is not playing I still think hazard wont play 90 if he is not benched from the start. What can I say but last week was one of the worst ever. 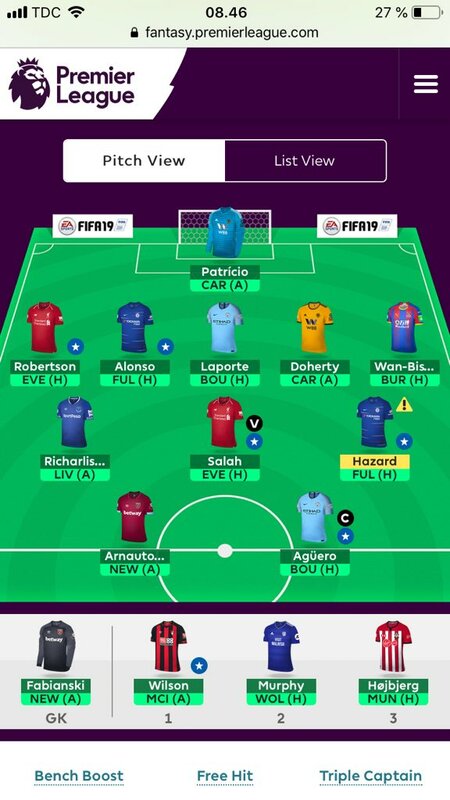 This week, rather than get in Hazard in who is coming off injury, I have opted for Sane due to his good form and reasonable assurance of starts with Mendy injured. I am playing Stones although my guess is that he wont play but will play in GW15 on Wednesday. I have enough cash to do Aguero to Kane next week if I want, but I am looking to eventually get Sterling in rather than Aguero due to Aguero’s inconsistency in road games. I may also downgrade Alonso to TAA or Laporte as well to use the extra funds. No time to panic yet but the results have been disappointing. 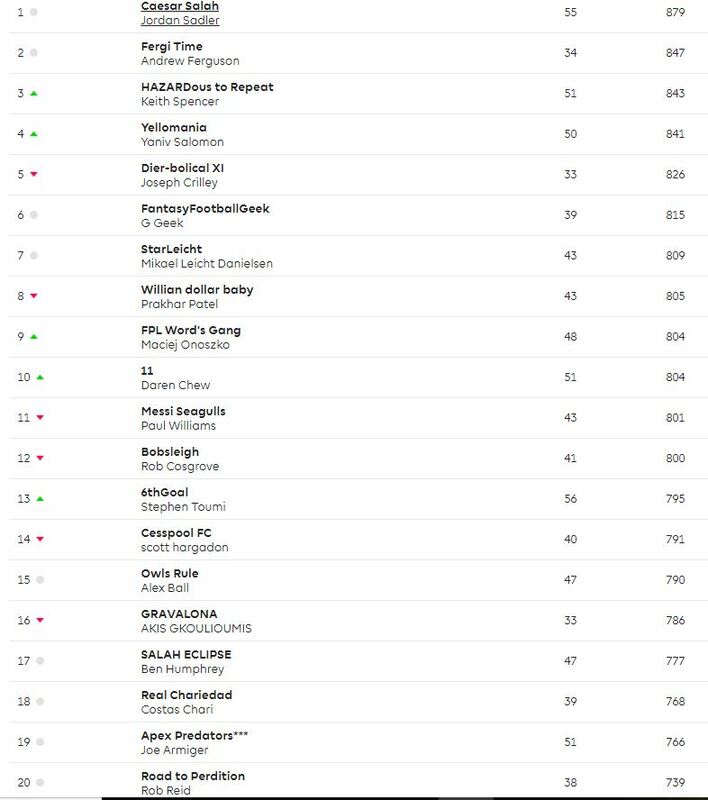 After a disastrous start to the season I am rock-bottom in the contributors league, way off the top 100k OR mark, and struggling in my own mini-league, which has lead to ridicule left and right. This has to come to an end. Lacazette has been underwhelming since I brought him in some gameweeks ago, and my Gundogan gamble during the last wildcard went south (what was I thinking with that one, he’s always an injury risk!). I will try to take advantage of how the midweek GW 15 and round six of UCL (11-12.12) will affect some manager decisions. Chelsea, Man City, Man U, and Arsenal sealed their places in the knock-out rounds of their respective European competitions, with the first three having tasty fixtures this weekend. Pep’s unpredictability is helped by injuries to Mendy, B. Silva, and KDB, which is why I added Sane to the team. I noticed that he has returned every time he has started, and I think he is pretty nailed on to start against Bournemouth this weekend. Mendy will be sidelined for quite a while, which will definitely help Sane’s minutes. I had to sell Lacazette to fund Sane (taking a hit in the process), and in my opinion Mitrovic was the best option. I am not sold on Ings (my main problem this season is players picking up injuries) and I feel that Murray is too inconsistent. Let’s hope that Fulham’s performance last week wasn’t a fluke. I can’t decide whether to give Wolves one last chance to deliver a clean sheet or be extra optimistic with Mitrovic away at Stamford Bridge.. decisions, decisions.. Aguero gets the armband as he has scored in every home game this season!